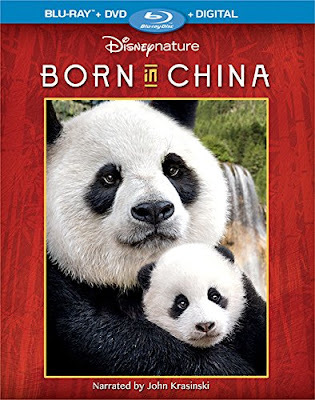 Born in China is another Disneynature film release, which means that the wildlife docudrama is primarily being directed at young audience members, leaving out the bigger issues and harsh realities. It isn’t exactly that the depiction of wildlife has been censored, because there are many tragedies to occur to and around the animals the film chooses to focus on, but the demise of animals is implied rather than explicitly shown. While this may sanitize the film for its G-rating, all parents know that human children are as inquisitive as the baby panda in the film. This inevitably forces the parents watching the film with their child to have the conversation about death that Born in China avoids with some pandering to the common religious beliefs of the region, conveniently aligning with the studio’s “circle of life” philosophy. But this is likely to mean little to young children, who simply want to know what happened to the animals when the camera cut away. Although surprisingly bleak and depressing in sections, Born in China does follow through on its promise of beautiful photography. Covering the diversity of landscapes in the country, the cinematography of Born in China is breathtaking enough for adults to long for a more sophisticated delivery of the images. But this film has clearly been formatted to follow in the footsteps of Walt Disney’s True Life Adventures series, overlaying dumbed-down narration over mostly cutesy images. The film crew may not have been able to avoid the brutal realities faced by their chosen subjects, but the editing team sure works overtime to make certain that this is not the primary focus of the narrative. The story involving a female snow leopard protecting her two young cubs is incomplete and depressing, nearly the entire way though. The story of the baby panda growing up and parting ways with the mother that raised him is likely to give even the most calloused viewer feelings of separation anxiety by association. This only leaves the narrative of the golden snub-nosed monkeys to provide a heartwarming turnaround, which is a welcome relief from the overwhelming amount of death and despair hidden beneath John Krasinski’s cheery narration. Other animals and their adorable offspring have brief supporting roles in the larger picture, but these three animals remain the primary focus of the film. Oddly enough, despite the claims that Disneynature has made a contribution from the film’s profits to World Wildlife Fund in order to benefit the endangered animals in the film, there is no discussion about the environmental and human elements which have endangered them within the narrative of the film. And the claim that “a contribution” has been made does not give any information about the size or significance of this contribution in comparison to the profits the studio makes off of its audience base of animal lovers. One can’t help but wonder to what extent this was more a marketing tool than an actual attempt at nature conservation. The Blu-ray release comes with DVD and digital copies of the film, along with four featurettes and a music video for special features. The first featurette “Panda Suits & Bamboo Shoots” is a behind-the-scenes look at the difficulty the crew faced in trying to get through the thick forest to the secluded panda bears. “Walking with Monkeys” shows the cold conditions endured by the crew to capture the images of monkey behavior, and “Masters of Camouflage” highlights the efforts to keep cameras and crew completely hidden from the elusive snow leopard. The final featurette, “Wading Through Wetlands” shows a journey northeast to film the first moments of a red-crowned crane chick. The music video is “Everything Everything” by American Authors.